I found another tree that is no longer dormant on the block that I walk between my office and parking garage. Most of each of the branches are red or red brown and the largest of the buds are only 1/4" maximum. 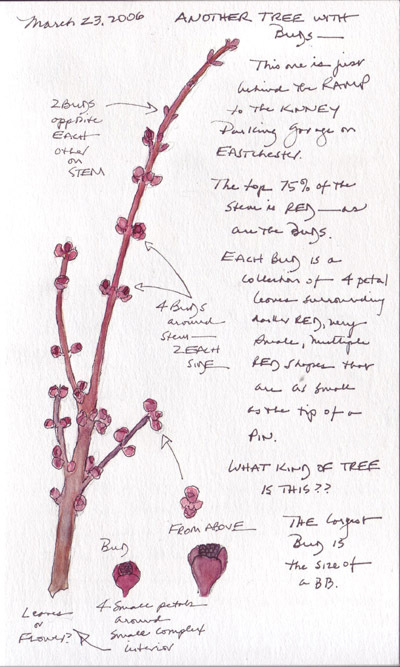 The buds are extremely complex when viewed with a magnifying glass (see separate sketch of buds at the bottom). There are 4 petal-like structures and where they are open you can see 8 or more circular structures that are darker in color. Each one of them is barely larger than the tip of a pin. The buds are arranged in fours - around the stem - or as a pair on opposite sides of the stem. I decided to watch this tree change over the next few weeks and then to try to ID the tree type. My walk is more interesting since I now have a sweet gum tree and this unknown tree to observe over time. Those who know me might have said that the appearance of "PEEPS" on the grocery store shelves heralded the arrival of my spring. When I left for work, with a wind chill of 15 degrees, on Monday AM, I seriously considered sketching and painting two boxes of Peeps for this challenge. Today, however, one of a long row of sweet gum trees that line the block between my office and parking garage was definitely "blooming" with multiple 3/4" buds along each branch. All of the other trees in my neighborhoods look dormant. My other favorite signs of spring are the many beds of tulips that bloom all along the streets and in the flower beds in the city - a wild profusion of colors. The tulip plants are approximately 4-6" in height today and many actually look like mutants! Did they always look so twisted and deformed? I will have to inspect them daily to watch them flower to answer that question. I also brought home a sweet gum seedball that was lying with hundreds of others below the trees. Laura's paintings inspired me and my husband challenged me to TRY to sketch and paint my own. I really think they are works of art all by themselves. In May 2002, my husband and I rented an apartment in Venice for our 35th anniversary and invited our family to join us for the week. My daughter and her husband, my two sons, and their girlfriends (who are now my wonderful daughters-in-law) joined us for a very memorable vacation. I love Venetian paper and immediately considered drawing this frame for the challenge, but I definitely didn't want to draw more portraits! 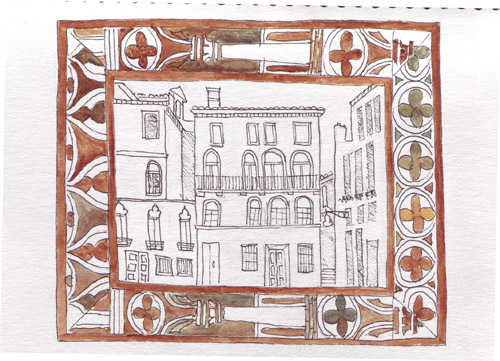 Therefore I sketched a photo of our Palazzo in Campo Santa Marina and "put" it in the frame. The frame is wooden, but the design section is a piece of handmade paper that is set into the frame. I loved that trip and just thinking about it makes me smile. Today I decided that I really should put the photo of the apartment in the frame permanently. 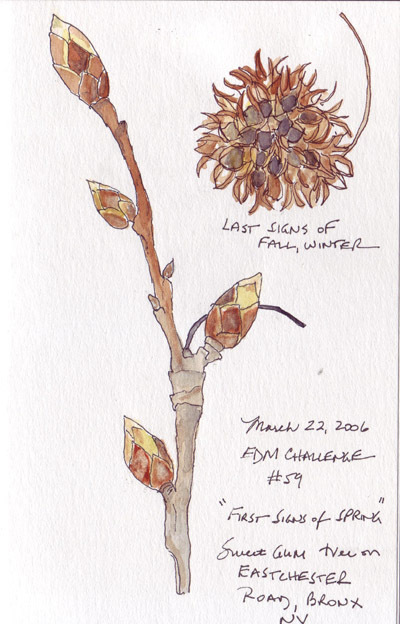 Exploring sketching and watercolor painting was one of my personal goals after I partially retired in July 2005. I worked through the Challenges after I joined the EDM group in September, and then decided to try to sketch (with or without watercolor wash) every day in 2006. I'm constantly searching my apartment for things to draw and fill in some days with a monthly color challenge or sketching a small, jointed artist model in various positions. I have lots of patience for hand quilting - taking months to complete a piece. But my sketches tend to be very fast, and not very precise. I'm trying to slow down enough to really see what is in front of me but I need to balance this with the time it takes from each day's schedule. So far I have at least one daily sketchbook entry since Dec 26th. 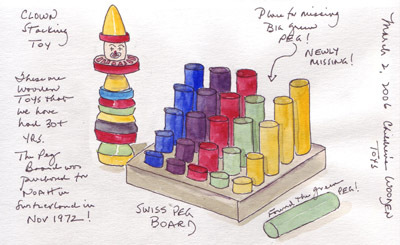 It was fun for me to sketch/paint the above wooden toys yesterday. We bought them 30+ years ago for our first little boy and now they are part of our grandchildrens' toys that wait for them in our apartment. 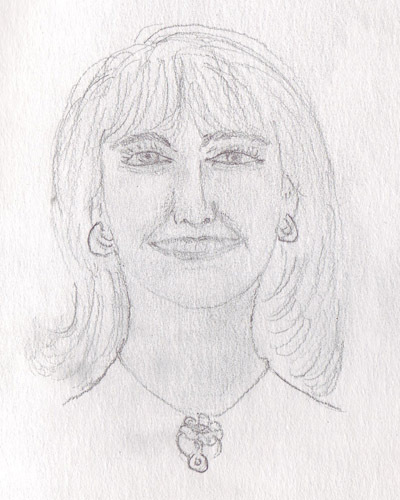 This is the first self-portrait I have ever done - and one of the first pencil sketches. I took all of the advice from the Everyday Matters group today and my choice was to make myself look 20 years younger! Seriously, neither my husband nor I see a resemblance, so Karen will have to repeat this challenge so I can obtain more skills before attempting self-portrait #2. 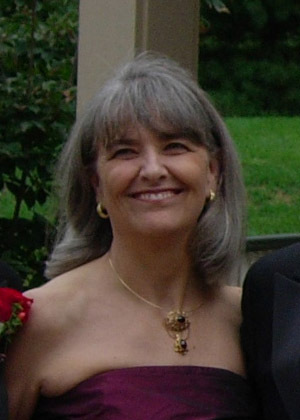 The drawing was made from the photo that I added, taken at my son's October wedding. I don't even have any fixative for pencil sketches, so this image will slowly fade away in my sketchbook.